We suspect everyone on the Champion New Zealand Tour woke up this morning and said, “what the heck was that”! Four days and four nights of living the racing dream concluded yesterday for 7 wonderful and enthusiastic Champion Thoroughbred clients as they returned home from visiting the great racing nursery of New Zealand, a place that has produced champion racehorses like Phar Lap, Carbine Tulloch, Kindergarten, Horlick, Ill Tempo, Sunline and more recently Ocean Park and Sacred Falls. The tour group comprised of Mark and Marcia Bailey, Manny and Megan Perez, Carole Richards, Caroline Foote and Dave O’Neill. Unfortunately, we did have two late cancellations due to family commitments so a cozy group of 7 headed across the ditch. 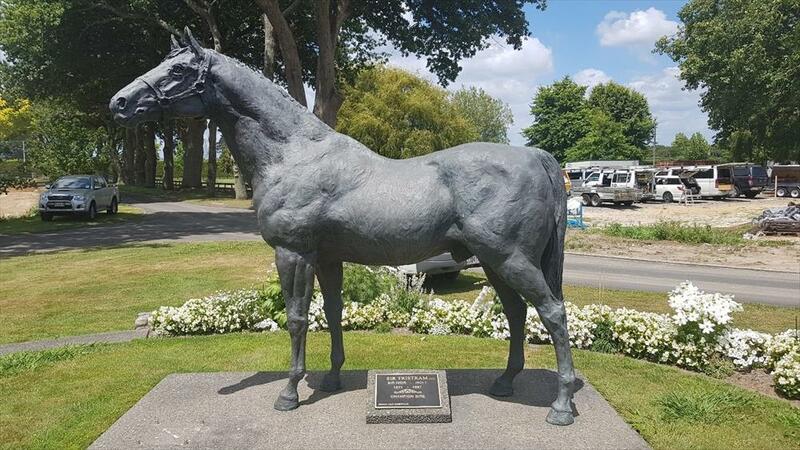 The tour officially commenced on Friday 25th with a day trip down to the great Waikato Stud where Mark and Marcia Bailey got to meet (up close and personal) the sire of their filly “Holy Water” in Champion miler and 4x Group 1 winner Sacred Falls. They also got to meet the sire of the dam of Holy Water in the great racehorse and champion sire Savabeel. It didn’t stop there as Marcia also got to meet Iguazu’s Girl (Scared Falls’ dam). After a wonderful tour around Waikato stud (and after failed negotiations to secure Manny Perez on the stallion Roster for 2019) we headed off to the major influencing stud in New Zealand in Cambridge Stud. At Cambridge Stud, Dave O’Leary and the team,spoilt us rotten with a delicious lunch in new office and former home of Sir Patrick Hogan. We had a deep insight into Cambridge stud as we visited the grave sites of the great champions Sir Tristram and Zabeel. The stud itself is undergoing major renovations as new owners Brendon and Jo Lindsay (and the owners of the 2019 Karaka Millions winner Probabeel) reinvigorate and return Cambridge Stud to its former glory. We got to see Tavistock up close and he looked stunning put on a show to let us know he is special! That night John and Jason shouted the team to a delicious dinner at leading Auckland restaurant Botswana Butchery. Everyone had a wonderful dinner with much humour and plenty of laughter. The Pied Piper (and smooth dancer) of the tour, Mr Manny Perez, lead a late-night tour of the roof top bars in Auckland and was followed by a few (un) willing characters. The next day the team was treated wonderful breakfast at Waikato Studs O’Reillys entertainment area at Karaka. The team then had their first look at the quality yearlings on offer. 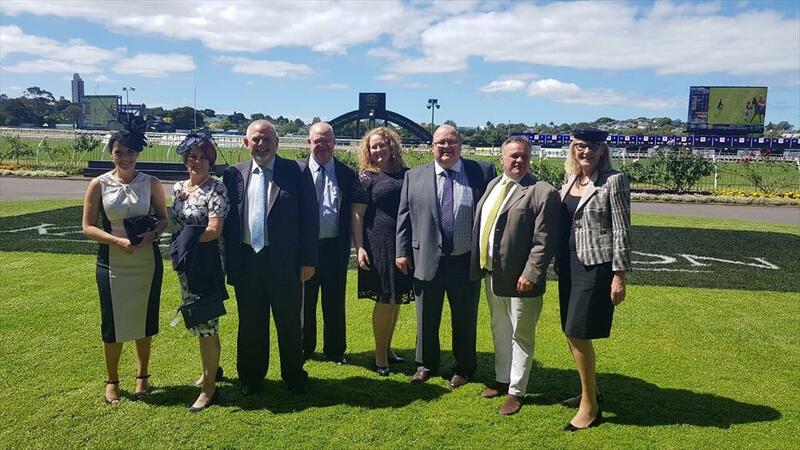 The inspections concluded at mid-day and the team went back to the Cordis Hotel (ex-Langham) to get ready for the Karaka Millions which commenced at 4.00pm. Neill had a little surprise for the tour group as when they arrived at the gorgeous Ellerslie racecourse, they were ushered through the Jockeys Room into the birdcage and then into the winners circle for a champagne or two before heading to the luxurious New Zealand Bloodstock Marquee for the Cocktail Party where they enjoyed good racing, great champagne and delicious food all afternoon / evening. A special “Rosie’s Tip Sheet” was provided for the day. It must have been the champagne (or the fact it was written in kiwi) as not one of the team picked up on the Karaka Millions trifecta (in order) that was clearly printed on the sheet! The following day was sales day and before the sale commenced John and Jason shared their secrets with the team and explained what they looked for in yearlings. At the conclusion of the inspection the team headed for the auditorium and watched the first 100 yearlings sold. The sale was very buoyant and so was the tour group after enjoying a delicious arrays of lobster tail, lamb chops, pork belly and chicken lunch at Pencarrow Stud s famous hospitality marquee and then finishing off the day with plenty of Verve, whitebait fritters and salted caramel ice cream at O’Reillys. The official Tour concluded on Sunday evening and the consensus from the group was not to advertise the tour ever again and to keep it very quiet as they all will be returning next year! So please don’t tell anyone about the how much fun we all had or the wonderful people we met and the great looking horses we saw. The team departed New Zealand on Monday and left John and Jason (and one very knowledgeable and forward-thinking Champion owner Carole Richards) to their business and secure quality animals to offer to our clients …. And they haven’t let us down. This morning Jason announced that he had purchased a lovely Sacred Falls filly out of a Pins mare (full sister to Mackintosh) which will be joining the Champion stable. Jason also informed us “I think you better start taking names for the tour next year because if we don’t make this an annual pilgrimage we will get shot” So if you are interested in joining us next year please email Neill as soon as possible spot will be limited to 14.